Conversation hearts are a Valentine’s Day icon – and even if you don’t enjoy eating the powdery candies nowadays, you probably remember exchanging them with friends and your valentines as a kid. Â A few companies make conversation heart candies these days, but the original are Sweethearts Conversation Hearts, made by NECCO. Sweethearts got their start in the 1860s, when the brother of NECCO’s founder, Daniel Chase, began experimentally printing messages on small, crisp candies that the company produced. At first, the messages were imprinted by hand, but he refined the technology until they were printed directly onto the candies using a die-cut press and vegetable food coloring. The messages started out almost like the messages that can be seen in fortune cookies today, as there was a trend at that time for small paper messages to be put inside of edible candy shells. For instance, a wedding message might have read “Married in Pink, He will Take to Drink” – a funny “fortune” that would be good for a laugh at a party. The message-bearing candies originally came in a wide variety of shapes and sizes, toÂ accommodateÂ different lengths of text and different occasions. The candies were a huge hit with customers, who loved the novelty of seeing a note printed directly on something sweet. It was around the turn of the 20th century that the look and shape of the hearts that we recognize today became more standardized. And that classic look and taste is the same one that we still get today when we buy Sweethearts. 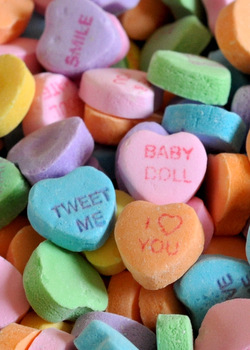 The messages on Sweethearts today tend to be Â short and sweet – just like the candies. They typically say things like “Call Me” and “Be Mine,” but more modern messages that include “Tweet Me” have been added in recent years. Today, more than 8 billion Sweethearts are produced every year – which translates to 50 tons of hearts. 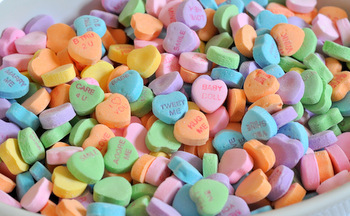 Competing Â conversation heart companies, like Brachs, produces their candies in huge numbers, as well. They’re still eaten and shared by millions of fans every year. They’re also used for decorating cakes and other Valentine’s Day treats, as well, because there will always be something very sweet about saying “Love You” with a tiny pink heart. I saw a recipe for homemade sweethearts on Pinterest, but somehow, there’s a nostalgia surrounding the boxed ones that always brings me back. I live on the western end of MA. I remember the first time I visited Boston and saw the NECCO factory (NECCO: New England Candy COmpany). 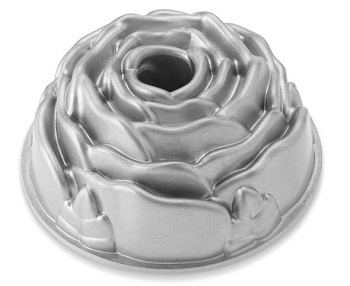 I literally wiggled in my seat, as their product is my favorite (sorry Brachs!). I can still see it there (not really in Boston, but in one of those towns that blends into Boston so you can’t really tell where you are, LOL). It was interesting seeing this history. Thanks, Nicole!